For the past three or four years, we’ve been evaluating our Stallion Day, and wondering whether it doesn’t need a dash of reinvention. Everything has a shelf life, and while it has become an institution of its own on the South African racing calendar and continues to attract a large local and international following, we’ve felt for a while that there might be value in “parking” it for a year, and then bringing it back in a revised format. Winning Isn't Everything. But It Is The Only Thing. While his first runners show their form, Visionaire is penning his own history: don't be remembered for missing out. First, this "lightning bolt" won by daylight at Turffontein. Now, he's done it again at Greyville; Rabada shot home in theGatecrasher Stakes (Listed) for Michael Azzie and the Joostes, becoming Brave Tin Soldier's first Stakes winner. Are You On The List? "Racing's Best Day Out." Unveiling new kids on the block, "X-Factor" racehorse, Capetwon Noir and the redefinition of the international racehorse, Linngari. Dubbed ‘Racing’s Social Event of the Year’, the Summerhill Stallion Day, held at the School Of Equine Management earlier this month, attracted guests from close on 20 different corners of the earth, Kings, Queens and Princesses from three Royal households, Ministers of State, Presidents and Chairmen, and importantly our breeder colleagues… Jimmy Lithgow shares with us his view of the day’s proceedings. They came from close on 20 different corners of the earth, Kings, Queens and Princesses from three royal households, Ministers of State, Presidents and Chairmen, and importantly, our breeder colleagues. In the worthiest of causes, they gave generously to our School Of Equine Management Excellence. In a world characterised by promotional hyperbole and information overload, the events they advertise sometimes fall short of their billing. Yesterday, Summerhill held its 31st annual Stallion Day at the School of Equine Management Excellence, and the occasion was dignified by the presence of heads of state, cabinet minsters, representatives of three different royal families, close on 20 different countries and more than 500 guests. SUMMERHILL STALLION DAY : "RACING'S BEST DAY OUT"
It’s been more than fifteen years since a pressman famously dubbed the Summerhill Stallion Day “Racing’s Best Day Out”, and this year, judging by the response from far and wide, it will be no different. Royal Academy was a Group One winner at 1200 and 1600 metres. His only Group One winning son at 1200 and 1600 metres is Ato. The best son worldwide of the best American sire since Bold Ruler in 2012/13, was Await The Dawn. Monday 7th and Tuesday 8th July, Cathsseta and School of Equine Management Excellence Winter Workshop featuring some of the world’s top presenters on racing, breeding, leadership and the business environment. Summerhill’s Stallion Day is firmly glued on the racing calendar. Last year, more than 500 people from 23 different nations attended. for the first time in the “flesh”. 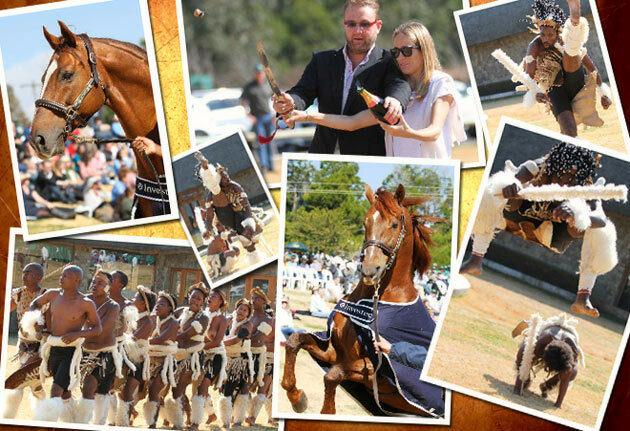 2013 Investec Summerhill Stallion Day. Liesl King - After a day of racing, that included the greatest race in Africa, the G1 Vodacom Durban July, it seems fitting to be spending a day in the heartland of the Zulu Kingdom. Known as fierce warriors, the Zulus are also great singers. There is nothing quite like walking along a stone pathway, flanked by Zulu singers welcoming you in full voice. The sound reverberates around you, words lost on the wind, but the big smiles make the message perfectly clear. Welcome to Summerhill Stud, home of an extraordinary family, for there is no other way to describe the relationship between owner Mick Goss and his staff. The Sunday after the July would seem like the perfect day to get up late and slowly migrate to a comfortable spot in front of the television, all the while nursing that hangover from the day before. Yet hundreds of guests from all over the world chose to rather get in their cars and head out on the long drive to the little town of Mooi River. For on its outskirts lies the stud farm of Summerhill, where for many years, Goss has hosted the Summerhill Stallion Day. 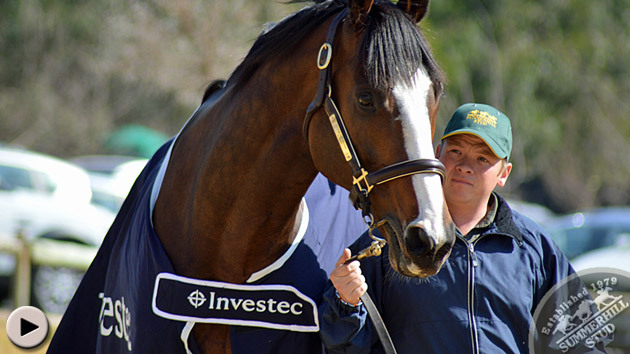 Three years ago, Investec came on board and one is now cordially invited to the Investec Summerhill Stallion Day. But apart from that, nothing much else has changed. After being warmly welcomed by the singing Zulus, guests are handed a fluffy Investec blanket to ward off any chills coming from the snow-covered Drakensberg Mountains. Seated on the grassy bank of a natural auditorium, we eagerly await the arrival of the stallions in their Investec finery, while soaking up the welcome rays of the sun after weeks of grey rainy skies. Suddenly Mick Goss appears, looking down from the bank, he seems small in stature, well that is until he starts to speak. For there surely is no greater orator in South Africa when it comes to the story of this little part of the Zulu Kingdom and that magnificent animal we call the Thoroughbred racehorse. Goss starts off by introducing a newcomer to the farm, as PJ The People’s horse makes his entrance. Pierre Jourdan is not a stallion, in fact he is a rather ordinary Thoroughbred. With skew legs, a distinctive roman nose and a pedigree that did not set the world alight, the plain bay is just that, plain. Yet while he may not have the looks or the pedigree, Pierre Jourdan (Parade Leader) had the heart and the bay gelding came perilously close to winning the Triple Crown, going down in the last leg. Maybe it was his looks, maybe it was his gutsy attitude, but the ugly duckling instantaneously became the people’s favorite, known simply as PJ, the people’s horse. Newly retired to Summerhill, he proudly led the stallion parade. Variety is the spice of life with stallions and Summerhill is no different. Brave Tin Soldier (Storm Cat) is as beautiful as he is elegant and regally parades for the guests, while Mullins Bay (Machiavellian) made a dramatic entrance that would be hard to top. Walking into the auditorium, the stallion made it only as far as Goss and his podium, before rising high on his back legs. The rear was graceful and perfectly balanced, the teeth on display were not. A son of Sunday Silence, Admire Main, had clearly been taught better manners in the faraway land of his birth, posing for the barrage of cameras without batting an eye, before A.P. Arrow (A.P. Indy) did exactly the opposite. His feet were seldom on the ground and his mane flew in all directions as the gleaming ball of chestnut muscle threw a tantrum before his audience. That set the scene for the troupe of Zulu warriors to make their entrance. And, in true Zulu tradition, they were heard, long before they were seen. Stirring battle cries filled the air, before a group of traditionally dressed Zulu warriors made their way into the auditorium to perform a war dance usually reserved for the eve of a battle. It was awe-inspiring and frightening all at the same time and the audience to a man, could easily imagine the fear of the foe, as thousands of these spear-carrying warriors, in full cry, appeared over the horizon at dawn. One gets transported back in time, watching these dancing Zulu warriors, but the tantalizing smells wafting up from the kitchen drag you back to reality, suggesting that lunch would not be a far-off affair. As always, Cabriere cellar master Takuan von Arnim, deftly assisted by Coolmore’s Sophie Magnier, performed the ritual sabrage. The sabre flashed in the sunlight and the champagne cork flew skywards without a drop being spilled. All that was left was for the Summerhill staff to sing the National Anthem and a song for the gravely ill, Nelson Mandela, before sitting down to lunch. As the sun set over the paddocks, guests, reluctant to leave, mingled to the sounds of the band, sated by good food and even better wine. Summerhill may be a bit off the beaten track and remember to pack your winter woollies, but your welcome will be immensely warm and sincere, here in the land of the Zulu warriors, where that magnificent animal, called the Thoroughbred racehorse reigns supreme.